RAID, the Royal Academy of Illustration and Design, is a Toronto comics studio, and home to Francis Manapul, Ramón Pérez, Gibson Quarter, Ian Herring, Irma Kniivilia, Nimit Malavia, Taran Chadha, Anthony Falcone, Scott Hepburn, Gabe Sapienza, Marcus To, Eric Vedder, Joe Vriens, Tri Vuong, and Tonci Zonjic. The studio got its start fifteen years ago, when it consisted of Cameron Stewart, Kagan McLeod, Ben Shannon, and Chip Zdarsky, and when, if we believe Chip's introduction, its acronym stood for Racists Against Impaired Driving. They all left over the years, making way for the talented list above, who have now put together this very handsome and well-designed anthology, which debuted at Fan Expo this year. 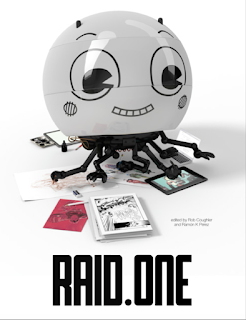 RAID has been bubbling away in the Toronto scene for some time, with many of its members being regular attendees at local comics shows. They released an anthology comic for Free Comic Book Day this last year, but it is with this book that their diversity, versatility, and collective talent really shines through. As with any anthology of this size, there is something for everyone, and some stuff that doesn't resonate with every reader. I was pleased to see another chapter in Ian Herring and Daniel McIntyre's Junior Citizens, a series I've liked since I picked up an issue at TCAF a few years back. Marcus To's story, Peaceful, shows artistic depth not usually seen in his Marvel and DC work. Likewise for Francis Manapul's story, which has his usual close eye for layout and design, but more heart than I find in his DC writing. Pérez closes out the book in fine style, with a mostly silent story about a clown that reminds me of his wonderful work adapting Jim Henson's A Tale of Sand. The best story in this book though, is Tonci Zonjic's 'Not Dead', which has a pair of scavengers working their way through a debris field in space. Zonjic told a similar story in the FCBD book, as he explores themes of isolation in the future. This story stuck with me more than the others. In all, this is a gorgeous book filled with top and emerging talent. I would love to see more collaboration between these creators, and more showcases for their work like this. I highly recommend picking this book up, even if you don't live in the Toronto area (here's the link again).